Surely, this is a delicious and nutritious dish to cook for your breakfast. It will supply your body with a big amount of protein that is so good for your health. Dietarians say this food will help you to avoid hunger during the day. To add vegetables to your omelet is a wonderful decision, but cheese is high in fat and sodium, so by consuming it you may gain weight. You’d better give preference to various veggies and you will enjoy flavorous taste of your breakfast. Whole grain cereal is considered to be one of the most wholesome foods, especially if eaten in the morning. Though, there are certain reasons due to which it can be bad for you. For example, most cereals usually contain some sugar that will give extra calories to your body. That’s why you should always control the sugar content when buying whole grain cereal for your healthy diet. Make sure you consume minimum sugar for breakfast and you will certainly benefit from it. Drinking orange juice in the morning is one of the greatest breakfast mistakes. I should say that in compare with the fresh fruit, juice doesn’t have all the nutritional values you need. Moreover, this drink is rich in sugar. For this reason, I advise you to remove any kind of juice from your breakfast and choose the actual fruit instead. Fresh orange or apple is a nice source of natural sugar for you. As it has been already mentioned, you should minimize your daily intake of sugar in order to stay active and beautiful for a long time. Don’t believe all the labels saying that oatmeal is good for your heart while it is full of sugar. If you have sweetened oatmeal for breakfast regularly, you can be sure you consume sugar in excess. Actually, oatmeal is a kind of dessert as it is often served with different flavors like apple cinnamon or maple raisin. I think omelet with veggies will be much better for you. Yogurt with fruit is one of the top favorite foods eaten for breakfast. You’ll be surprised to know that those sweet and yummy fruits on the bottom yogurt are incredibly high in sugar. All your attempts to make a perfect choice will be ruined because this yogurt will cause you to gain weight. Try to look for some plain yogurt and add fresh fruit to it. You will get the most delicious dessert and healthy breakfast together. I know plenty of people who can’t imagine their breakfast without whole wheat bagels. Being loaded with carbohydrates and having not enough protein, this food must be eliminated from your morning menu. Whole wheat toast and peanut butter are healthy sources of carbs for you. By switching to these foods you’ll provide your body with protein and avoid extra calories. Breakfast is the first meal of the day that should be balanced and nutritious to give you energy and health. Some people make a big mistake when eat little during their breakfast. In the morning, our body works more actively than at other time, so we need more food for energy. If you have a small breakfast, just in a few hours you’ll be hungry and not able to work well. Moreover, when you come back home in the evening, you will eat everything you can find in your fridge and it will definitely lead to weight gain. Make it a rule to have a substantial breakfast and you will see the difference. 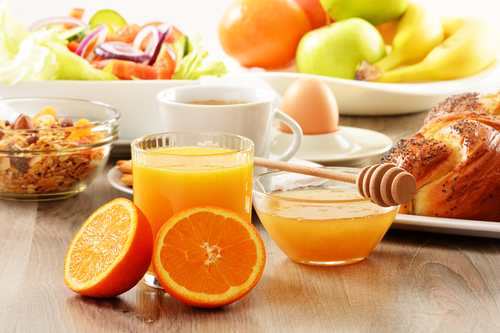 I hope that after reading these recommendations you will pay more attention to your breakfast and choose the healthiest foods to start your day with. Be careful not to make all the above mistakes and you will achieve great results in losing weight. What foods do you usually eat in the morning? Do you benefit from them? What breakfast mistakes do you usually make?